This version of Projected Ghost, adds a twist to make the presence a tad more ethereal. Rather than using a static ghost image projected onto veil, scrim or gauze, I chose to use a super 8 projector with film loop rather than a static slide machine or holiday projector. Additionally, instead of just having it rise from the ground (aided by back to back rotating mirrors), I chose to make a small platform for the projector that pivots back and forth, adding a touch more fright might by having it travel in 3 directions. Now that was a great idea gang, but have you tried to get super 8 film these days, and if you can find it, have you tried to have it processed? YOWSA! This was all inspired by a costume a friend wore last year, a rather fantastic zombie\ghost. So she will be immortalized with digital imagery in character. 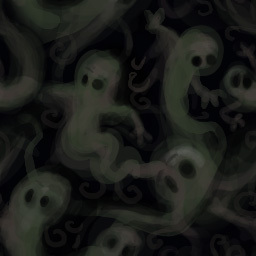 After seeing what the apparition looked like on fabric, I thought there could be more substance to the illusion. So... her apparition will be projected both onto the scrim and a wall of fog. Better yet, I was able to get a LCD overhead projection panel for 10 bucks on eBay, and thanks to some connections I will have aan overhead projector in the near future. For now, I do have a holiday projector to use for the light source. In prototype the idea is to have the light source and panel swivel back and forth slowly on a lazy suzan type apparatus, but this is really moot, since I can video anything I really want and just alter the image and projection window to do as I want. The biggest limitation to this is that I need to use a computer to drive the image on the LCD transparancy panel. Of course it will be rendered full screen output. But this computer itself needs to be indoors, the rest I can bable to, and build a moisture proof house for the panel et al.